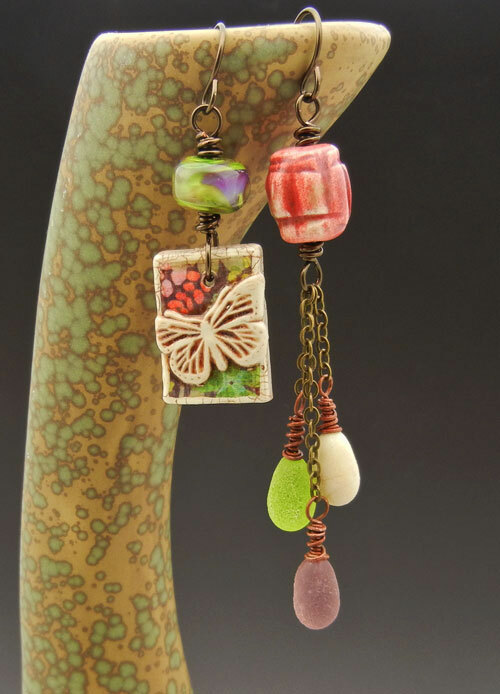 Today is the reveal for the Mismatched Art Bead Earring Swap organized by Diana Ptaszynski of Suburban Girl Studio. I jumped at the chance to participate in this swap because I personally love this trend. Mismatched earrings are so much fun, but every inch a challenge – much thought and skill go into designing a well-balanced pair that look like they belong together. My very creative partner, Kari Asbury of Hippie Chick Jewelry, did a fabulous job making a statement with the earrings she designed for me. The challenge required that participants have a blog and use at least one art bead in each earring. Mine are just brimming! The polymer charm is by Martha Eason of Menagerie Studios, where you’ll also find some fantastic fleur-de-lis and crosses. The green lampwork bead and headpins are from Raida Disbrow of Havana Beads, an Etsy shop lush with the colors of fall. And the red ceramic bead is by super-talented artist, Nan Emmett, of Spirited Earth. Now, head over to Kari’s blog where you can see the earrings I designed for her. Then check out the work of the other swap participants. I know I can’t wait to savor all the asymmetrical goodness! Interesting swap! I'm not sure I could wear mismatched earrings - against my OC nature! But I love the colors in these gorgeous earrings you recieved - and none of them are "my color" - but the palette is very pleasing! Fun earrings - enjoy them! I love the colors in these! They are more mismatched than I think I would be comfortable with, but they are very beautiful! These are just beautiful, they're very mismatched but work so well together. I saw the earrings you made for Kari too, gorgeous! Drop dead gorgeous. I would totally wear those! Wow! She totally captured the idea of the mismatched earrings. Just gorgeous. Ooooooo those are super cool! I'd wear them in a hot minute! Thanks for participating! What a fun swap this would have been. have enjoyed looking though. Also, as a follow up to your comment on my blog today on the micro-macrame. I added information on who created the e-course that I took. It's Joan Babcock at micro-macramejewelry.com. Beautiful! I know you'll treasure those :) I love the ones you made for Kari! Oh I love how Kari pulled together the colours from the charm in the other earring. Really beautiful! Really fun earrings! The polymer pendant and glass headpins are fantastic. You combined the elements and color palette beautifully.